This Waverley bakery bakes the usual lineup of bread, croissants, sausage rolls and sandwiches — but it's all gluten free. When you're used to having only one option on a menu, it's easy to be flawed with indecision when you actually have to make a choice. 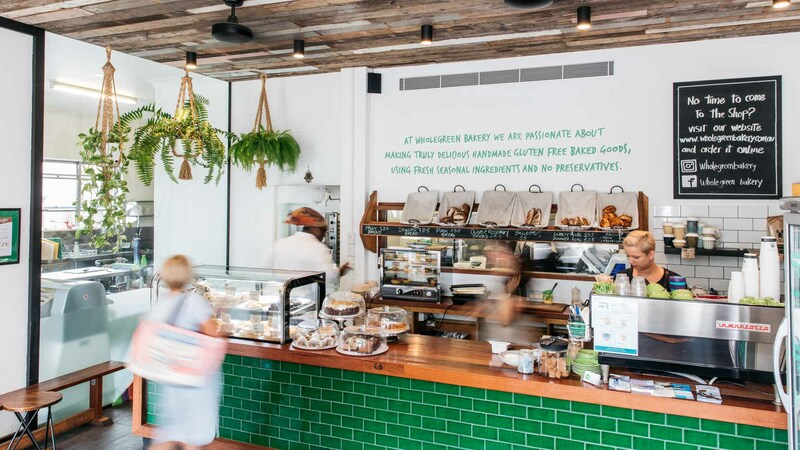 So be patient if the queue sometimes stalls at Wholegreen Bakery — everything here is 100 percent gluten-free, and the options for coeliac and gluten intolerant Sydneysiders are delightfully extensive. Owner Cherie Lyden got into gluten-free when her daughter was diagnosed as coeliac and needed to eliminate gluten from her diet. She quickly found she was "disappointed with what was available on the market" and, in an effort to lift the — sometime dismal — standards of gluten-free products, she started doing what no one else was doing at the time: making actually good gluten-free bread. She's operated the wholesale side of the business for five years now, and the Waverley cafe for three. The bakery is particularly exciting for coeliacs because the kitchen is completely gluten-free, so nothing at Wholegreen has the chance to be cross contaminated. Coeliacs have a sensitive reaction to even a small trace of gluten, so much so, that baking 'gluten-free' loaves in the same oven as regular bread (or even putting them in the same toaster) essentially strips it of its gluten-free credentials. To that end, Lyden says that Wholegreen "provides a space where people can eat with confidence". It took Lyden and her team of bakers around six months of testing and tweaking to get the sourdough recipe right — that is, crusty on the outside, chewy on the inside, and without the use of preservatives and gums. At the shop, she sells straight-up loaves alongside seeded, fruit and olive ones for $8.50 each, as well as baguettes and rolls. Everything is baked in-house each morning, meaning that baguettes on the front counter (filled with ham, cheese and salad) can be eaten fresh — a rare occurrence in gluten-free sandwich eating. And, yes, there are pastries. Pastries! But only on Fridays and Saturdays. On those days, the kitchen team rolls out mounds of flaky, glossy croissants (plain and almond), pain au chocolats and pain aux raisins. They're denser and more cakey than regular croissants — and they're usually all sold out by mid-morning. Other, week-round treats, may include muffins, lemon tarts, chocolate eclairs and fruit-filled brioche rolls. Savoury pastries abound, too, with sausage rolls, chicken and mushroom pies, and spinach and feta pasties served hot. There are a few spots in the cafe to sit down with your gluten-free haul and a coffee, but it's largely used as a takeaway spot. We recommend driving around the corner to Clovelly to eat by the beach. If, despite your best efforts, you can't get to Waverley on a Saturday, you can find Wholegreen (and its croissants) at Carriageworks Farmers Market and the North Sydney Produce Market each week. Plus, you can also place an order through local food delivery platform Food by Us.